Pre-heat the oven to 180C, and line a 23cm x 23cm baking tin with baking parchment. 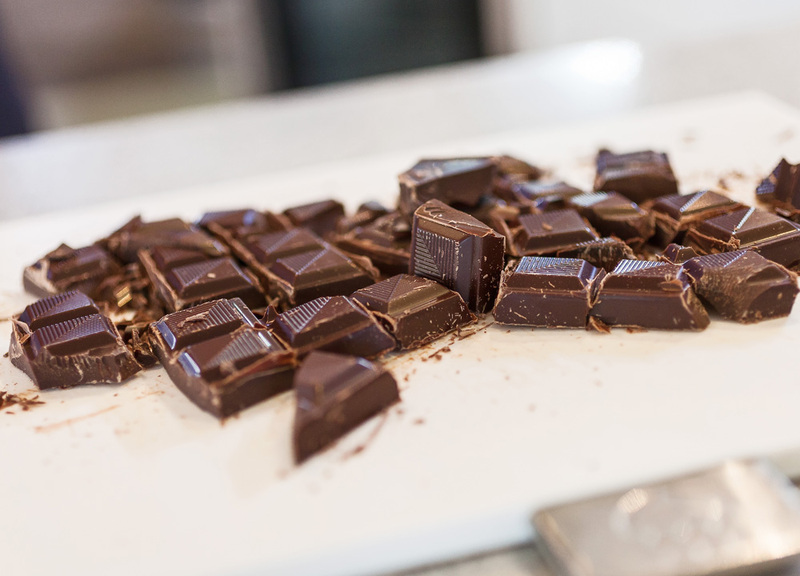 Set a bowl over a pan of slow simmering water, and add 200g of the chocolate, broken into small pieces. Melt slowly, stirring occasionally, and then remove from the heat immediately. Break the rest of the chocolate into chips, ready to add later. Meanwhile, using an electric whisk, beat the butter and sugar together until light and fluffy. Gradually add the eggs, beating well between each addition to ensure it’s thoroughly incorporated before pouring in any more. Leave mixing on a high speed for five minutes until the batter has increased in volume slightly and has a smooth sheen appearance. Gently fold in the melted chocolate and chocolate chips by hand, followed by the sifted flour, baking powder, salt, cocoa powder and walnuts if using. Spoon the mixture into a lined square baking tin (23cm), bake for 30 minutes. Test with a skewer for readiness; it should come out sticky, but not coated with raw mixture. If it does, put it back into the oven for another 3 minutes, then test again. Leave to cool for an hour before cutting into 9 squares. To make the candied nuts, melt the sugar in a pan over a light heat until an amber colour. Remove from the heat and stir in the pecans, tip onto a baking sheet and leave to cool. Roughly chop up and serve on top the brownie and cream. To make the cream, mix the cream and yoghurt together and whip to soft peaks. Stir in everything else, chill until needed.